The La Quinta Inn & Suites Grand Forks has been awarded the 2016 TripAdvisor Certificate of Excellence award. 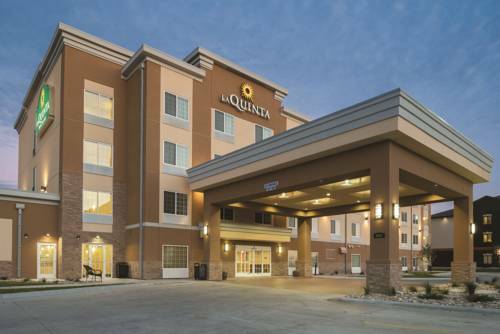 The brand new La Quinta Inn & Suites of Grand Forks hotel is conveniently located just off Interstate 29, just East of the Alerus Center in Grand Forks, ND. If an event at the Alerus Center brings you to town, you'll love the convenience of being walking distance from the hotel. We are also conveniently located just 1 mile south of the University of North Dakota main campus, 7 miles southeast of the Grand Forks International Airport, and 2 miles southwest of the Ralph Engelstad Arena which is home to the UND Hockey Team. Our new, modern, and fresh La Quinta Inn & Suites goes above and beyond to offer everything you need to feel assured, settled in, and optimistic while staying with us. Relax in one of our clean and comfortable guest rooms and enjoy access to our business center and new state of the art fitness center. We offer free high-speed internet access, 100% non-smoking hotel, an indoor pool and spa with a pool for children. The guest laundry facility is available at a nominal fee. Our guest rooms are equipped with microwaves, refrigerators, 40" flat screen TVs, Pillow-top mattresses, coffee makers, hair dryers, iron and boards, and free local calls. You can also stop by our Bright Side Market if you forget any of your essential amenities. Our meeting facilities make this a great place for your next meeting, baby shower or any special events. Wake up on the bright side and start your day off right with fresh coffee, tea or hot chocolate, assorted juices, rotating hot items, pastries, breakfast breads, hot and cold cereals, hard boiled eggs, a fresh assortment of fruits and waffles. ~36 miles from Grand Forks. ~41 miles from Grand Forks.